The Tahoe Rim Trail is a 165-mile (266 km) long-distance hiking trail which forms a loop around Lake Tahoe in the Sierra Nevada and Carson ranges of California and Nevada in the United States. The trail ranges in elevation from 6,240 feet (1,900 m) at the outlet of Lake Tahoe to 10,338 feet (3,151 m) at Relay Peak in Nevada. 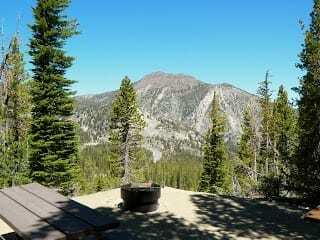 About 50 miles (80 km) of trail above the lake's west shore are also part of the much longer Pacific Crest Trail.